West, Ian M. 2017. West Bay (Bridport Harbour) Harbour and Beach - East Cliff: Geology of the Wessex Coast. www.southampton.ac.uk/~imw/West-Bay-Harbour-Beach.htm. Version: 14th August 2017. West Bay, near Bridport, Dorset is situated somewhat west of the centre of the English Channel coast of southern England. The British National Grid Map Reference is SY 467902. It is easily reached by road from Weymouth or Dorchester. There is no railway station there now. West Bay is small attractive holiday resort with an artificial harbour built in 1722. In 1403 Joan of Navarre arrived here en route to marry King Henry IV. Shipbuilding in the River Brit around here dates from the days of Alfred the Great in the 9th Century. More recently the schooner "Speedy " was built here in 1853 to compete with American clippers. West Bay, at the present time is used for yachts, fishing boats, fishing, beach activities and tourism. The mouth of the artificial harbour has been changed in recent years and a large "Jurassic Pier" has been built on the west side, so as to facilitate the entry of boats. This is a good, initial view point. The cliffs on both sides of the harbour provide excellent exposures of Jurassic strata. 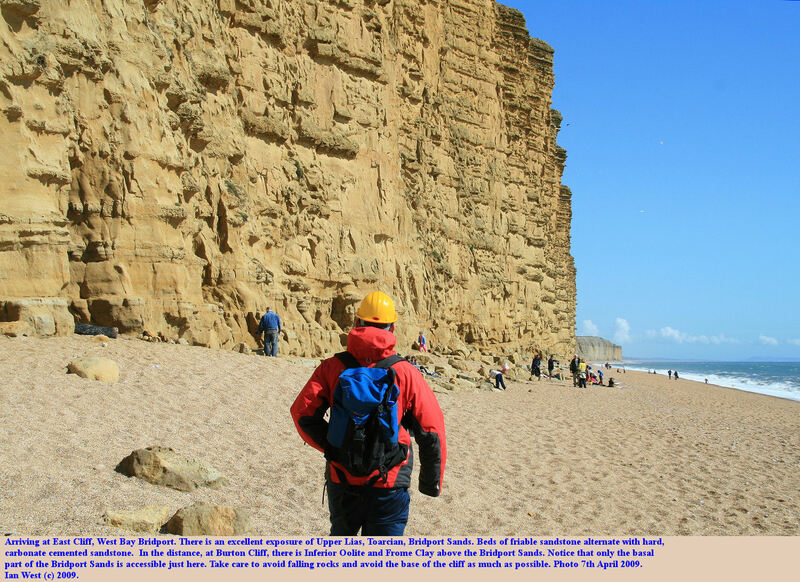 This guide is concerned with the eastern cliffs which expose the Bridport Sands of the Upper Lias, Lower Jurassic. This is also the western end of the Chesil Beach, 27 kilometres in length. The beach material here is very fine shingle, almost grit, of just a few mm. diameter. There are now erosion problems regarding the Chesil Beach which will be mentioned below. West Bay can be reached in about half an hour from Weymouth or Dorchester and in about one and a half hours from Southampton and probably about in an hour from Exeter. On both sides of the harbour there is parking for cars, mostly of expensive, short-term type. There is no coach parking just here. There is some long-term parking near East Cliff. There is a large long-term car park next to the old railway station (shown above), left of the road when approaching West Bay. The price for parking for a day here is much cheaper (one pound, 70 pence at present, 2013) than at the car park directly adjacent to the harbour. There are toilets adjacent to the old Salt House northwest of the harbour (not always open) also toilets adjacent to the small chapel east of the harbour. Other localities which could be used in conjunction with West Bay include West or Watton Cliff, just a walk round the harbour, or perhaps the Inferior Oolite of Burton Bradstock. At West Cliff there is middle Jurassic Frome Clay (Fullers Earth) and Forest Marble, and beyond, other parts of the Lias. There is an interesting fault at Fault Corner near Eype Mouth. Charmouth, near Lyme Regis is another good locality. At West Bay and the coast in its vicinity there are obvious risks, especially at at East Cliff. Major rock falls used to take place only on rare occasions. 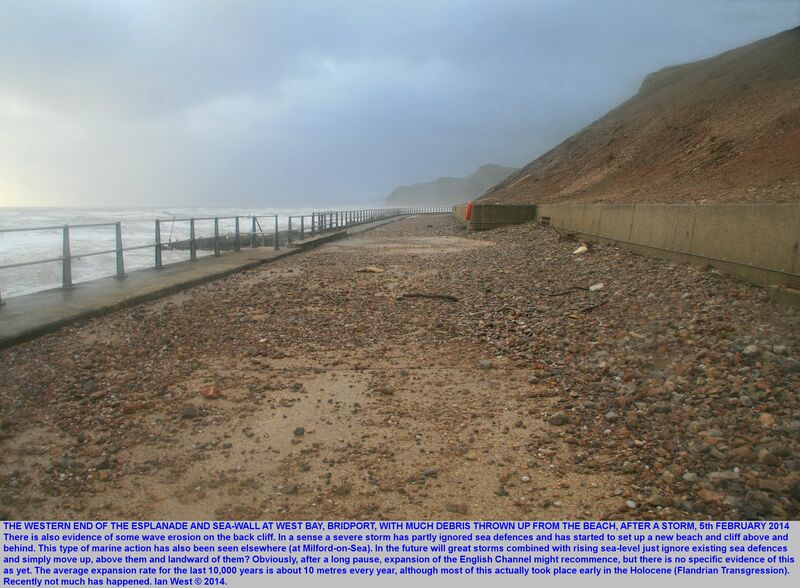 However, the beach may be narrower now, since it is no longer receiving direct supply from the Chesil Beach (which now ends at Burton Hive Beach, Burton Bradstock). A major rock fall has taken place recently. The cliff is not safe now. Recognise the danger! The rock fall shown above took place on the night of the 28th June 2017. It was not the only fall at about this date, but it was the largest and it was exceptional in cutting the cliff-top footpath and just extending back into the golf course. Two other falls were small but there is threat of at least one more large one in the near future because of an overhanging bulge of sandstone (with a small rock fall in the lower part of the cliff). The situation regarding East Cliff is not stable and not predictable. With luck, no-one may be directly affected, but it is necessary to keep clear of the foot of the cliff and stay out on the beach near the sea. Apart from occasional major rock falls, small but dangerous falls are possile. At any time small rocks can fall at high velocity, sometimes being dislodged by seagulls. Geological parties should, therefore, wear hard hats and it is important to minimise the time spent at the foot of the cliffs, or in some circumstances not to approach them at all (except at special places where the cliff is not high). Care should be taken with regard to sea and tide in stormy conditions. If a cliff top route is used then it is obvious that it can be dangerous to approach the cliff edge. Visitors and party leaders should make their own risk assessment in relation to the conditions at the time. A prerequisite for a geological visit to Bridport, Eype, Burton Bradstock, Charmouth, Beaminster or adjacent areas is the British Geological Survey map, Sheet 327. 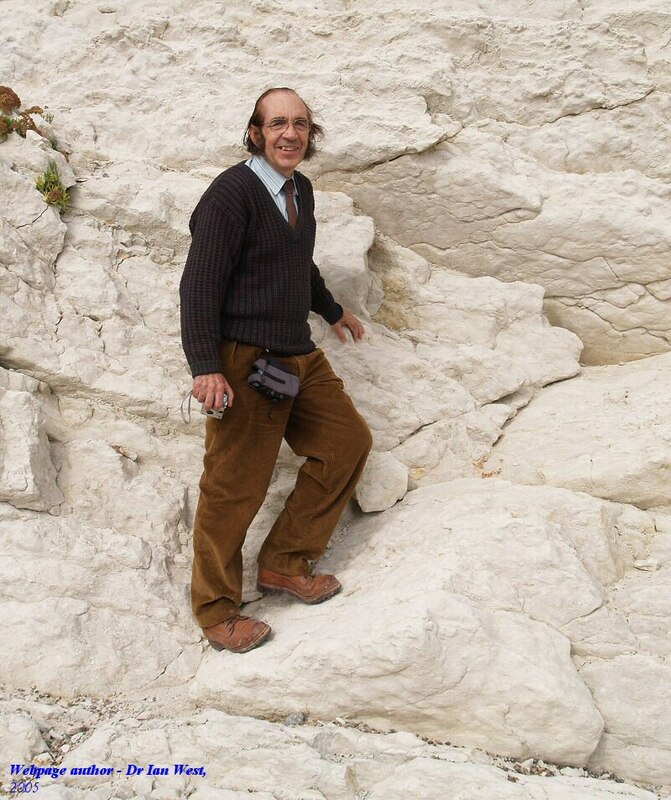 So too is the new memoir - British Geological Survey Memoir (2011), Geology of South Dorset. (Note that it includes Charmouth and east of Charmouth, including St. Gabriels Mouth and Golden Cap, but not Lyme Regis). (Incidently and mentioned just for interest, further down the beach to the east in " June 1757, a supposed mermaid was thrown up on shore between Portland and Burton, thirteen feet long; .....the head was partly like that of a man and partly like that of a hog. Its fins resembled hands;. ......it had forty-eight large teeth in each jaw. " (History of Dorset, 1774, vol 1, p. 338 1st ed. - referred to in Damon, 1884 ). It might have been a manatee or sea-cow washed in from somewhere far to the southwest. ). West Bay or Bridport Harbour is an attractive and interesting place situated where a river valley intersects the eroding cliffs of the Jurassic coast and the westernmost part of the Chesil Beach. It is similar to Lyme Regis in that there was in the past some sort of small natural harbour, but now the haven is entirely artificial and protected by sea-walls from the slowly encroaching English Channel, as the Holocene marine transgression continues. The Chesil Beach here was of fine shingle but it was a substantial and wide bank giving much protection to the land both near East Cliff and West Cliff. A relic of it exists east of the harbour. The river joined the sea close to East Cliff and not in the present harbour position (Payne, 1953). West Bay was originally very similar to Burton Freshwater, about one and half kilometres east-southeast along the coast. It was also like a smaller version of the coast at Axmouth, where the river runs out to sea next to the cliffs at the east end of the beach. These positions of the river mouths are the result of a predominant longshore drift direction from west to east in accordance with the prevailing winds. Later the harbour was artificially excavated in the centre between the two cliffs and the river was diverted into this. For a long time the relatively permeable and imperfect harbour entrance had little effect on the shingle beach and it remained well-developed on both sides of the harbour. From time to time there was storm damage to the harbour walls and phases of repair. See also Chesil Beach Storms and Flooding webpage. A haven being constructed at the estuary of the River Brit to the south of Bridport (Legg, 1999). This is probably at the old river mouth adjacent to East Cliff. 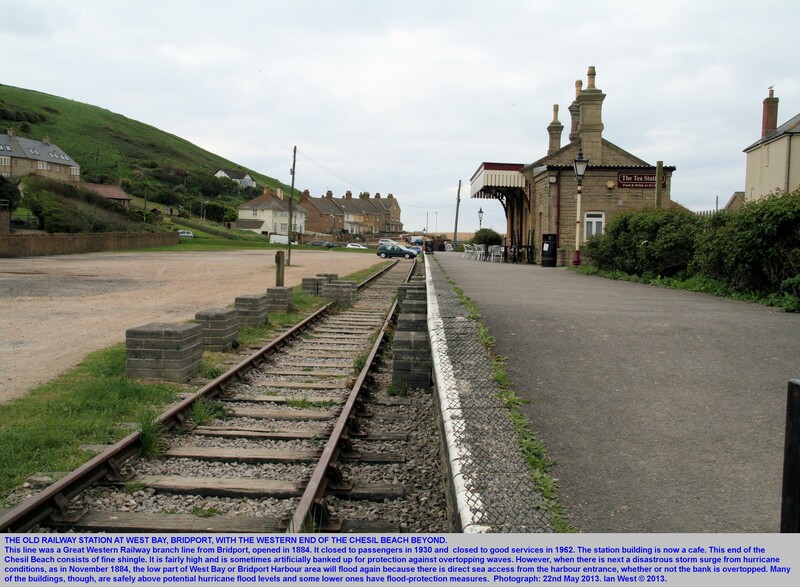 Shipping could originally navigate to Bridport unless the tide was unfavourable or a sandbank blocked the way. 1401 - Collections of money at Bridport for the clearance of the blocked and damaged waterway at the mouth of the Brit (Legg, 1999). This is probably due eastward longshore drift of shingle. 1558 - The estuary of Bridport Haven is no longer regarded as navigable and reclassified as a creek (Legg, 1999). 1607 - January - Major Sea Flood in Bristol Channel Area. 520 sq km of land in south Wales and south west England were covered by water. 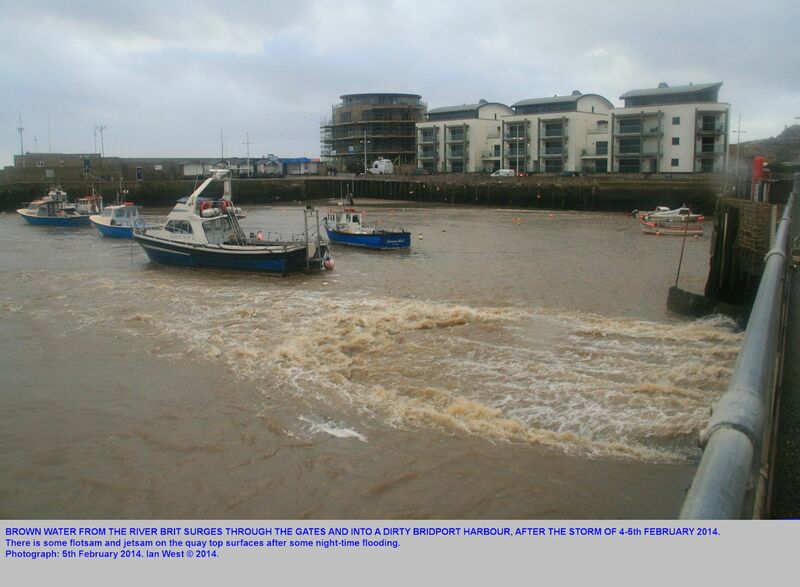 This great sea-flood in the Bristol Channel area was thought to have been caused by high tides and severe storms. A tsunami is now considered to have been a possible cause (BBC News on the internet, 4 April 2005 - Tsunami theory of flood disaster. ). 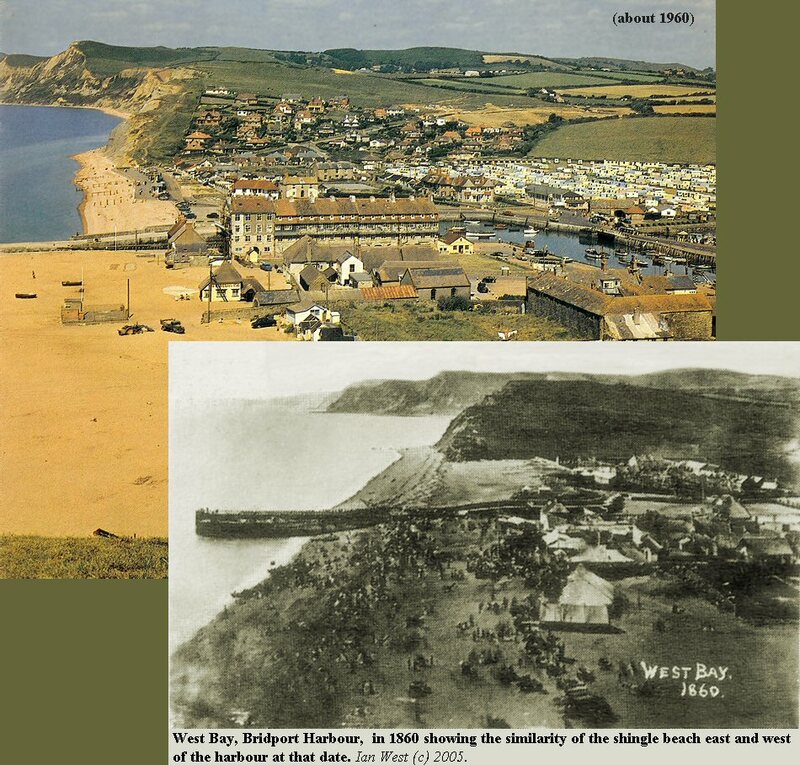 Did anything happen at West Bay or on the Chesil Beach? 1688 - The Town of Lyme in Dorsetshire suffered by an earthquake (Cox, undated) . 1722 - By act of Parliament land was purchased for the construction of the harbour at its present central site. A pier has been completed at Bridport and a small harbour has been built. The flow of the river is insufficient to remove the sand which blocks the inner haven. Ships above 40 tons cannot enter, even at high tide (Legg, 1999; (Atterbury, 2003). 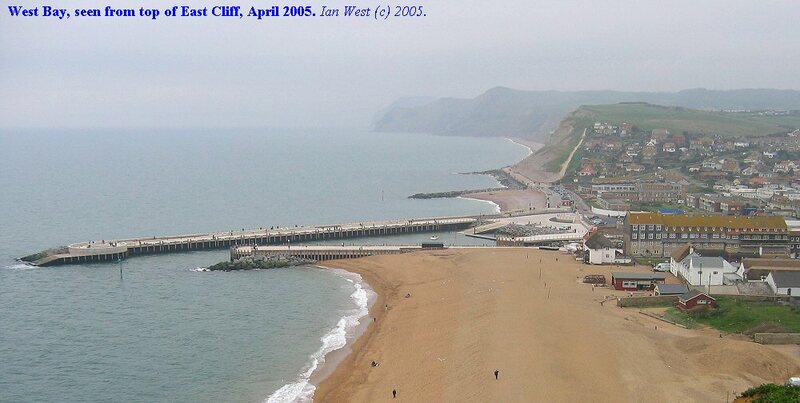 The pier and basin at Bridport Harbour was enlarged but was unsatisfactory in severe weather (Legg, 1999). 1759 - 31st of May. Tsunami? "The sea flowed 3 times in an hour at Lyme" (Cox, undated). 1797 - 18th August. Possible tsunami? "The sea as above attended by lightning" (Cox, undated). 1799 - 26th January. Tsunami at Lyme Regis. "The sea flowed as above with the shock of an earthquake about 4 o' clock in the morning (Cox, undated). 1824 - English Channel Hurricane and Storm Surge. There was a great storm on the night of the 22 November and morning of the 23rd. Vessels in the harbour were washed up onto the quay (i.e. seawater was above quay level as at Weymouth, Poole and Christchurch). A deep layer of sand was washed onto new harbour works. Thomas Major and his two daughters were drowned trying to escape the waves which hit their house ( Le Pard, 2000..
"To describe the state of the harbour is impossible. A quantity of timber is washed up near Marshgate and some much further. Roofs of shops, sawpits, etc have been carried away. Mr Good's rope-yard was washed or blown down and 29 sheep belonging to Mr Edwards were drowned..." (Sherborne and Yeovil Mercury, quoted by Le Pard, 2000). Marshgate or Marsh Gate is just over a kilometre back up the valley of the River Brit. Thus the storm-surge and waves not only flooded over West Bay and Bridport Harbour but probably also inundated the floodplain of the River Brit by seawater quite a long way up towards Bridport. 1897 (soon after) - Beach situation was very similar to that in 1867. The serious retreat on the west side had not yet commenced (see Atterbury, 2003). 1900 (about) - Beach retreat commencing on the west side. The impression from a postcard is of shingle accumulation on the east side and the beginning of loss on the west side. 1904 - August 26 - Landslide. A large landslide in West Cliff with Forest Marble debris collapsing over Frome Clay. The relatively narrow beach is completely obstructed (see Atterbury, 2003). 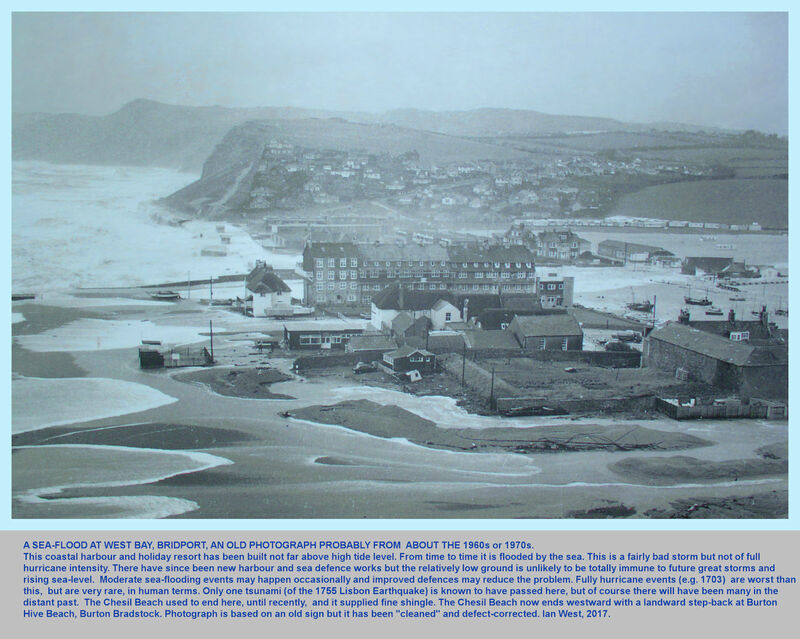 1908 - The beach is now retreating significantly on the west side (see Atterbury, 2003). Pre-1920s - Battery Point still has a flat top with a hut on it. West beach is of pebbles rather than fine-shingle. 1920s - The seaward limits of the beaches east and west of the harbour are at almost equal levels, but the west side has retreated a little. The low water position on the west side is at about the level of the landward end of the black hut on the east pier. There are now some buildings on the hill in the area of the West Cliff Estate, but they are well-back from the cliff edge. The main development of West Cliff seems to have been in the later 1920s. 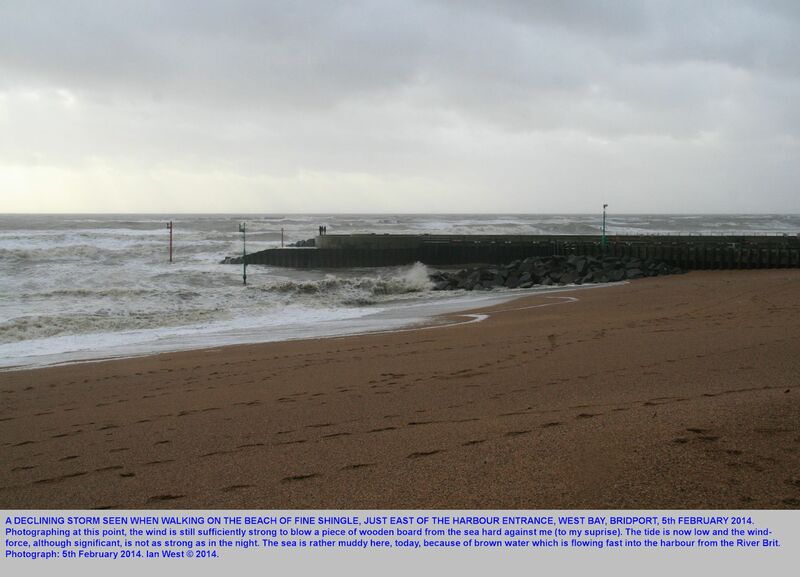 High seas caused flooding at West Bay on the 15 April. Atterbury (2003) shows a photograph of shallow flooding in West Bay road. By now there has been substantial retreat of the beach on the west side, with the position of the beach on the east side unchanged (Atterbury, 2003). 1930s - The shoreline has receded drastically on the west side, with groynes placed there to try to halt the serious loss of beach shingle. The last relic of the Bridport Sands Battery Point is being eroded away rapidly. The beach is very narrow and a danger sign has been erected there (Atterbury, 2003). 1935 - Landslide at Fault Corner, West Cliff, resulting in the Junction Bed no longer being accessible in the cliff (Wilson et al., 1958). Presumably this was the result of toe erosion. 1950s - Relatively narrow beach on the east side in front of the original promenade (not the modern extension). Battery Point has almost gone and West Cliff has irregular re-entrants caused by collapse of the cliff. 1960s - Sea defences were extended west beyond the original promenade and the eastern end of West Cliff was been reshaped and smoothed, presumably to defend the West Cliff Estate. February 13th. An unexpected early morning ground swell caused extensive damage and flooding. The promenade west of the harbour seems to borne the main impact and been damaged, with flooding of the businesses behind it. There was flooding in George Street. 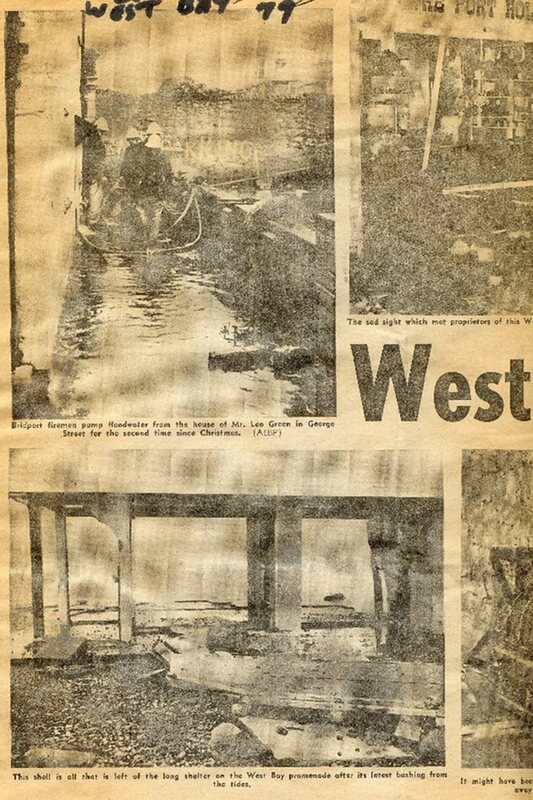 Details are given by Cash (1979).These unusually large waves caused much more damage at Chiswell, Portland. 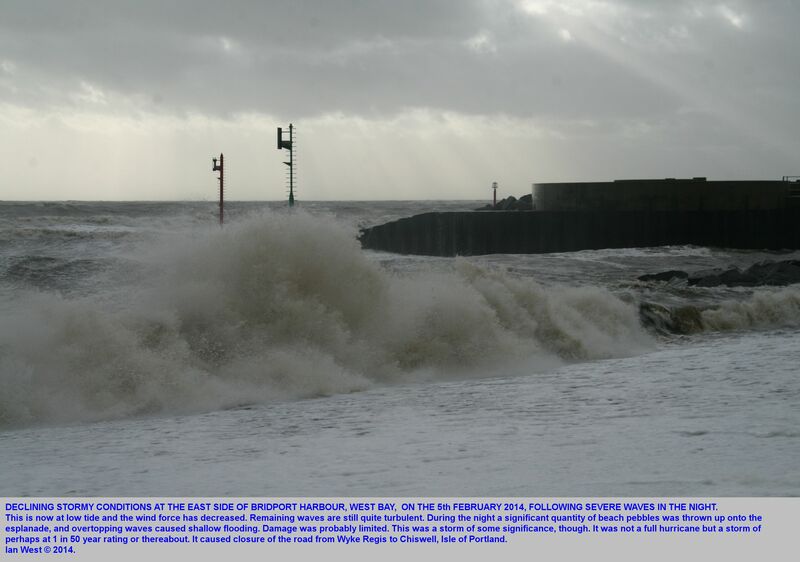 See the Chesil Beach Storms and Floods webpage. Shingle has still been accumulating on the East Beach; it has covered the eastern pier and started to silt up the harbour entrance. 1982 - Wave climate changed and accretion ceased on the east side of the harbour, and depletion of the western part of the Chesil Beach commenced (now in 2005 it is becoming a significant problem). See Bray (1992) and Hydraulics Research (1979-1991). 1991 - Erosion of East Beach. 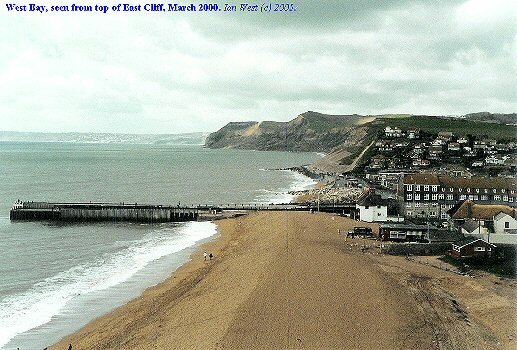 Recent erosion of the east beach at West Bay has occurred according to Bray (1992). A major beach nourishment scheme was proposed ( Hydraulics Research (1991b). Note that there are major problems from a conservation point of view in contaminating the western end of the world-famous Chesil Beach with extraneous and different pebble material. 2004 - Pier Construction Commences. The construction of the new, longer and oblique Jurassic Pier on the west side, by Costain. It was officially opened in early 2005. The use of the harbour is now recreational and fishing. 2005 - Depletion of the Western End of Chesil Beach. 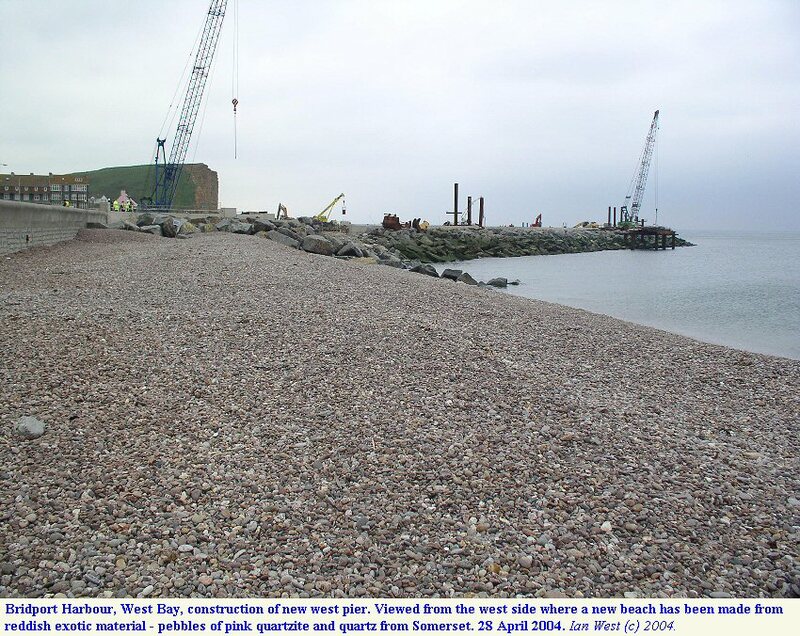 The depletion of the western end of the Chesil Beach on the eastern side of West Bay harbour continues to be a problem. There are effects at least as far east as Burton Bradstock. See photograph below. Some artificial embankment of the shingle on the east side of West Bay is now (2005) taking place as a precaution. January and February 2014 were times of several, quite severe storms (on the about 1 in 50 year scale). More detail is given elsewhere with regard to the Chesil Beach and to Hurst Spit. 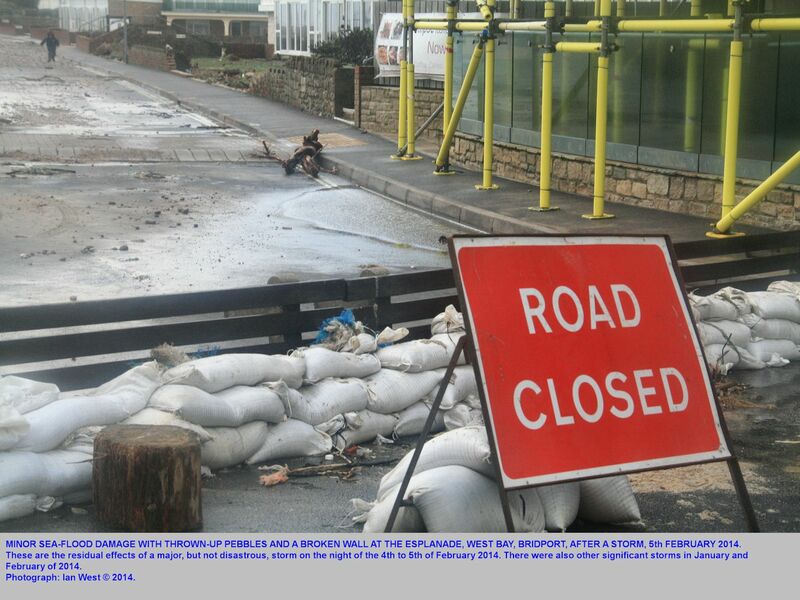 On several occasions, including the day of the photographs below, the road access from Wyke Regis to Chiswell was closed, usually because of seepage and overwash seawater driven by the storms. I only visited West Bay at the end of this particular storm, which was quite a bad one. It caused washover flooding and some trees were blown down. Numerous pebbles were thrown up on the Esplanade, and that was probably the most impressive feature. There was driftwood and flotsam on paths and roads around the harbour area. In broader perspective, more damage was done elsewhere (e.g. Hurst) during the later St. Valentine's Day storm of the night of 14th to 15th February. At Milford-on-Sea, pebble throwing by the sea smashed windows. About 600 beach huts were destroyed in the Bournemouth to Milford-on-Sea area. I was not above, however, to get to Bridport on the dates of this later storm. The coast was undeveloped here and river still flowing out at the east end of the beach when the English Channel Hurricane and Storm Surge of 1824 (the notorious Great Gale) struck the Chesil Beach and other coast of the region (See also Chesil Beach - Storms webpage. ). Repairs and development of the harbour took place shortly afterwards. Later West Bay increased in size, with only limited development on the floodplain, except at the edges. In the 1920s or 30 on the slopes north of the West Cliff (with its fault-shattered Frome Clay). It should be noted that there was originally some relatively resistant yellow Bridport Sands at former Battery Point on the west side in 1923 (Atterbury, 2003). The East Cliff, although much more resistant has fortunately, and perhaps surprisingly, remained undeveloped. It would seem unwise to do so now, but in the past beach material was exploited for commerce. Shingle was quarried away from the beaches in the areas of both the east cliff and the west cliff (Atterbury, 2003). This was removed by horse-drawn puts and later on the east side only by tractor and lorry. The products of this local industry of selling Chesil Beach shingle were removed by train from the West Bay station until 1962 (Atterbury, 2003). The harbour piers were progressively strengthened and improved at various times up to 2004. 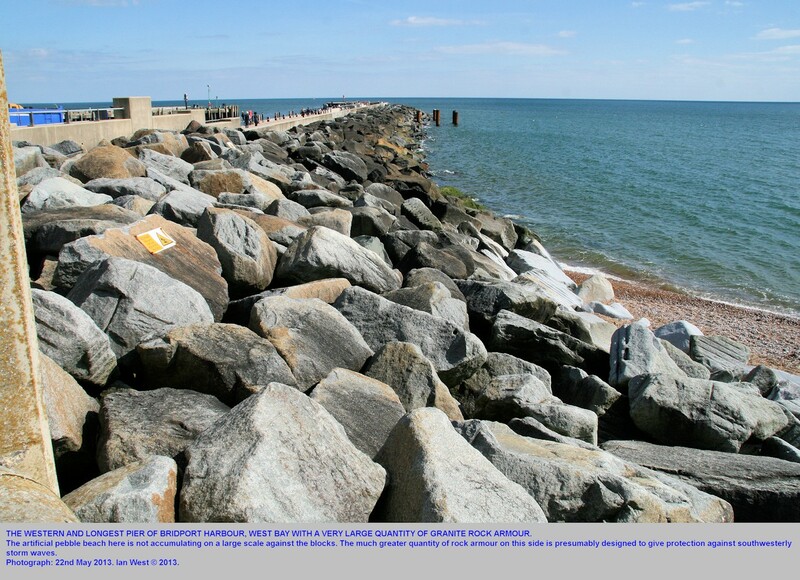 The stronger barriers prevented the movement of shingle by longshore drift. 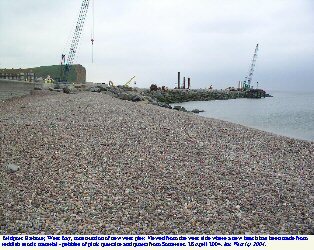 The combination of natural processes, the removal of shingle and the construction of the pier barriers resulted in the serious loss of beach material on the western side of the harbour and rapid erosion of the soft clay cliffs. This led to more sea defences in order to protect buildings on the slopes back from West Cliff. After all the removal of shingle, the beach on the west side was resupplied at the "red beach" with "foreign" shingle from Wellington in Somerset in 2004. Export changed to import. 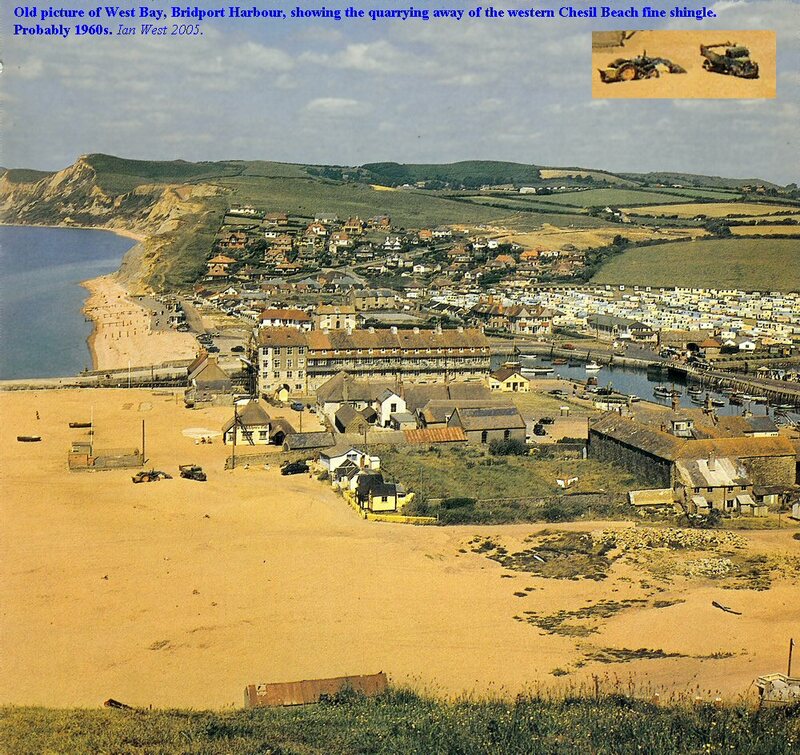 Examine the photographs and consider the future of West Bay. The new sea-defences are quite strong and have outer defences of rock armour so they will undoubtedly give protection against the moderate storm waves that do not exceed a certain height. The next occurrence of an English Channel hurricane and storm-surge like that of 1824 (and perhaps 1703), however, is likely to raise sea-level as before and overcome sea-defences at many places along the south coast. Consider in detail the records of the last such event (see Chesil Beach - Storms webpage)and think about the likely area of attack of the next storm-surge and to what extent modern sea and flood defences would mitigate the effects. With good luck, of course, the surge-storm may not return for a long time, but obviously just when is unknown, and the average return period for such storms has been established. To determine the frequency and return period of English Channel hurricanes it might be useful to study salt-marsh sediments in the region. In Oregon, Washington and British Columbia there is concern and precautions about tsunamis. Major events have not been known in the period of time during which the area has been developed. Now research has shown that these sea-floods occur there with about a 1 in 300 year average frequency. This average time interval was determined from the occurence of tsunami deposits in salt-marsh sediments, combined with some historic evidence. 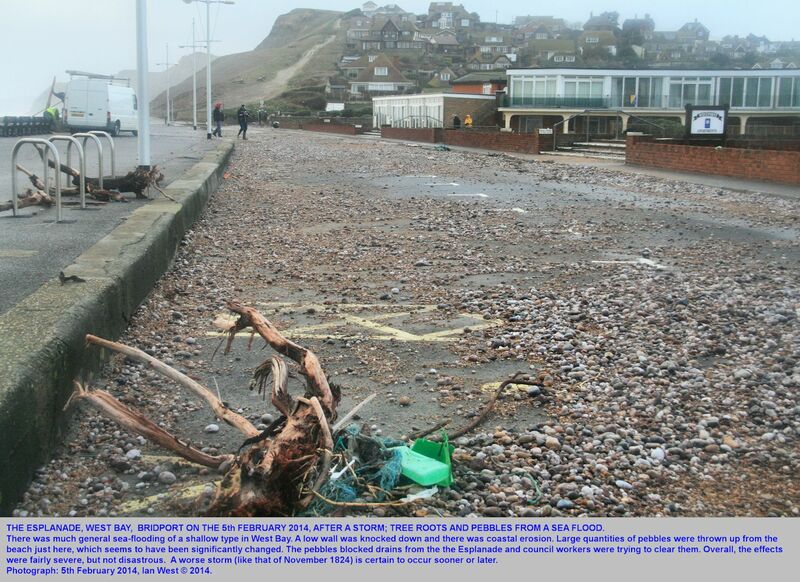 Incidently for shallow flooding by seawater of West Bay on 15 March 1922 see (Atterbury, 2003, p. 62). He also refers to a recent flood in 1974. See p. 63 for a picture of storm damage just west of the harbour pier on 16 April 1924. Here near the site of the landward end of the modern Jurassic Pier a building on the Mound and known as the Pavilion was destroyed by a storm in 1942. There are no photographs of devasting storms or floods. Above are views of the beach, harbour and piers taken at different dates. Look at the relative positions of the cliff line, and particularly the extent of the beach shingle seaward on both and east and west sides of the harbour. The major loss of cliff and of beach in the past on the west side is obvious. The photographs do not suggest much change on the east side, although before the 2005 photograph was taken there had been mechanical banking-up of shingle on the east beach. There was (in March 2011) and still is (May 2013) a large quantity of fine shingle banked up on the east side of the harbour. Banking up by machines may take place from time to time to increase protection to properties behind the beach. In addition though there seems to be accumulation of fine shingle, and also now, some sand. This is shown in a photograph from May 2013, above. 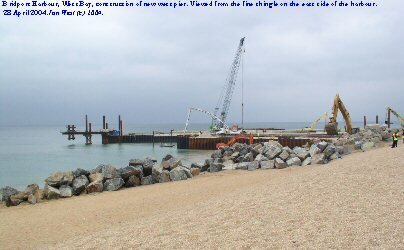 As can be seen from the photographs above, the building of piers here in the past, and the new construction of larger piers has produced, on a limited scale, an embayed beach system. The prevailing storm waves are from the southwest. The piers should reduce wave energy on the east side. This would be expected to be the site which has fine sediment, and indeed it has. Thus the particle-size sorting that characterises the Chesil Beach may be (and probably has long been) accentuated by the construction of an artificial headland or solid pier. The new eastern pier of Bridport Harbour, finished in 2005 is short. 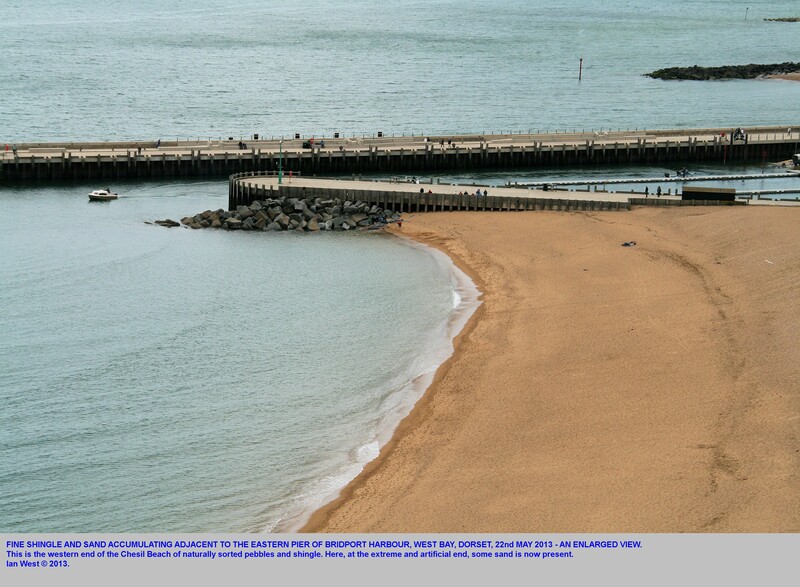 The reason for this is that the greater length of the western pier results in the harbour mouth facing towards the southeast and therefore away from the southwesterly storm waves. Because this eastern pier is not under direct attack from these waves it has less rock armour than the other pier. It is notable for holding back a large quantity of fine shingle and some sand which in the shelter of the piers drifts westward to some extent and accumulates alongside (i.e. on the east side). This pier, like the western pier, is not particularly high. High restrictions were imposed for environmental reasons during the planning phase. However, the piers necessarily high enough to deal with a major storm surge during a hurricane (a very rare event). A new western pier of oblique orientation was built in 2004 and finished in 2005. It has been named "Jurassic Pier". This later construction and the beach features can be compared in the photographs above. 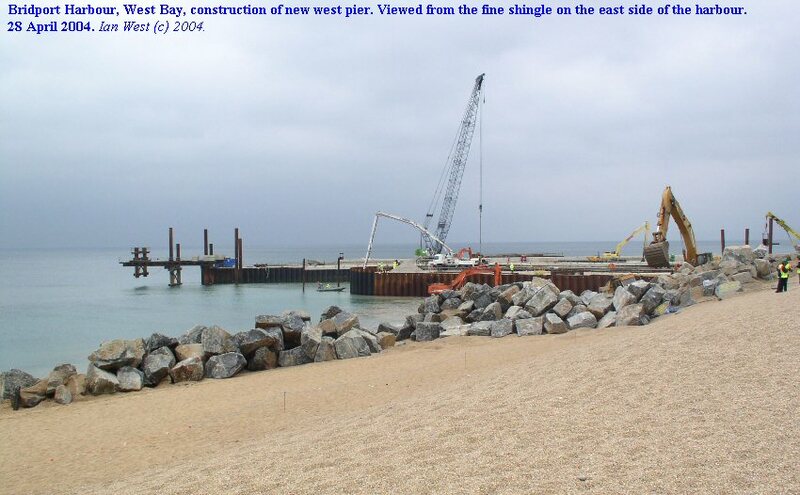 Some images are shown of the construction of the new pier taking place in 2004 and its later finished state. Bridport Harbour is an old artificial construction consisting of a basin for ships and a narrow entrance between two piers. The river Brit has been diverted into this harbour from an orginal route to the sea that was further east, adjacent to East Cliff. The narrow entrance has often been impassable to ships because of rough seas. Waves of very great fetch from the Atlantic Ocean can hit the beach and harbour piers here and thus there has been frequent damage to the piers by storms and periodic rebuilding. Flooding of the low ground by the sea also occurs from time to time. A new western pier is being constructed. Its trend is normal to the southwesterly storm waves and it is stronger and wider than the original pier, although no higher. The photograph above shows this under construction. The old west pier was being demolished. Details of the construction plans and information on the history of the harbour are on show in the old salt house northwest of Bridport Harbour. A new pebble beach has been created artificially just to the west of Bridport Harbour. This is of good appearance, but it should be noted that exotic material from Somerset has been placed on the shore in large quantities very close to the western end of the famous Chesil Beach. It is to be hoped that storms do not enable this to pass the harbour mouth and thus become incorporated within the Chesil Beach. Obviously, it would be deleterious to future provenance studies if large-scale contamination was to happen. I was told that in 2004 it was effectively confined by sea-defences. The new material is rather red-stained and consists predominantly of pebbles of pink quartzite or sandstone and vein quartz of "comby" type. It has not been studied in detail. The pink quartzite pebbles resemble Budleigh Salterton quartzites but are not of that origin. A grey, fairly even-grained granite or granodiorite of French origin is used as rock armour at the new pier. Small pieces of this have now broken off and present on the western end of the Chesil Beach just east of the harbour mouth. Although on a limited scale, contamination of the famous Chesil Beach with foreign rock is now in progress. A problem of shingle depletion has now arisen east of the harbour sea-defences, in what is the western end of the Chesil Beach. The shingle that remains is now being banked up by machines as a defence against the flooding by seawater of the floodplain of the river Brit behind West Bay. This is sensible since moderate storms are likely to be held back by this. Dredging and Disposal of Muddy Sediment from the Harbour Entrance Shoal. In March 2011, sediment had been dredged from the new harbour. This dark muddy material was being buried under the pebbles of the artificial beach to the west. It is believed the source of sediment that causes shoaling is material coming from the east. In the past much fine shingle was drifted from east to west (towards the harbour here), so this is not surprising. The sediment is very muddy and when transported along the sea front road to the western artificial beach it leaves much mud on the road. Thus dumper trucks tip large quantities of seawater on the road, and sweeper trucks work back and forth. Thus a clean environment is achieved once more. It is said that this process of shoal clearance happens annually. I particularly wish to thank Dawn and Tony Denyer for the opportunity to visit a coastal locality with similar features in Oregon. Doreen Smith has very kindly provided some photographs used in this webpage. I thank Dr. Lawrence North and Tongchen Han for discussion in the field of geophysical properties of the Bridport Sand. My wife Cathy West has supported in many respects the production of these webpages and this is much appreciated. Allison , R.J. (Ed. ) 1992. The Coastal Landforms of West Dorset. Geologists' Association Guide No. 47. 134 pp. Very good guide with a number of useful field trips. It provides a good reference list on landslides etc and has a glossary. Aplin , A.C. & Coleman, M.L. 1995. Sour gas and water chemistry of the Bridport Sands reservoir, Wytch Farm, UK. In: The Geochemistry of Reservoirs, Geological Society Special Publication No. 86, pp. 303-314. Bjorkum , P.A., and Walderhaug, O. 1993. Isotopic composition of a calcite-cemented layer in the lower Jurassic Bridport sands, southern England - implications for formation of laterally extensive calcite-cemented layers. Journal of Sedimentary Petrology, 63, pp. 678-682. Boswell , P.G.H. 1924. The petrology of the sands of the Upper Lias and Lower Inferior Oolite in the west of England. Geological Magazine, 61, 246-264. Bray, M.J. 1992b. Chesil Beach. In: Allison, R.J. (Ed.) 1992. The Coastal Landforms of West Dorset. The Geologists' Association, 134 pp., paperback, pp. 106-118. Bray, M.J. 1992b. Chesil Beach. In: Allison, R.J. (Ed.) 1992. The Coastal Landforms of West Dorset. The Geologists' Association, 134 pp., paperback, pp. 106-118. [This is a good and very useful paper; there is no abstract, but the following is an example extract of the text. See the original.] Example extract: "Reappraisal of Chesil Beach in the light of new information confIrms its relict status, although this is probably a much more recent phenomenon than previously supposed. 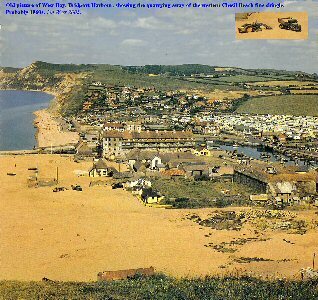 Transport from the eroding coast to the west could have supplied 14 to 18 million cubic metres of shingle over the last 4,000 to 5,000 years until the link was broken at West Bay harbour mouth in 1866. The beach must therefore be recognised as the major sink for coarse, durable products of coast erosion in west Dorset and east Devon over this period. These materials have been mixed with much larger quantities of gravel combed from the floor of Lyme Bay during the Holocene transgression and may have continued to nourish the beach as landward recession slowed 4,000 to 5,000 years ago. It can be postulated that the survival and possible enlargement of the beach during the rapidly rising sea-level of the Holocene transgression can be attributed to continued shingle supply and a facility for landward recession. 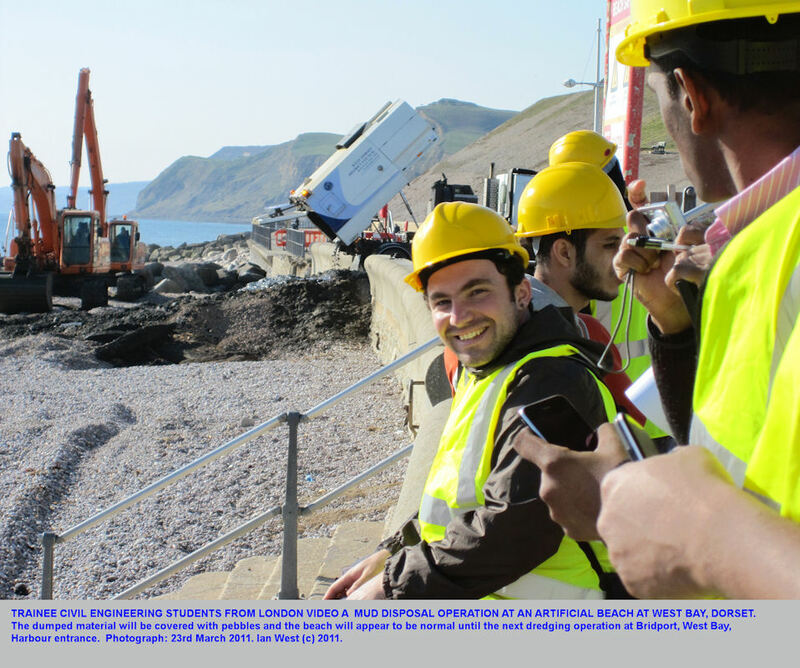 With current predictions of increased rates of sea-level rise and the potential for climatic change, Chesil Beach is entering a critical period in its evolution. Natural response mechanisms may be ineffective because the beach is now a finite resource and further landward recession is not possible at some locations due to adjacent cliffs and coast protection I sea defence requirements. Appropriate management responses may be necessary to carefully balance scientifIc interest against coastal protection." British Museum (Natural History) . 1962 and various editions onward. British Mesozoic Fossils. 207pp. Bryant , I. A., Kantorowicz, J. D. and Love, C.F. 1988. The origin and recognition of laterally continuous carbonate-cemented horizons in the Upper Lias Sands of southern England. Marine and Petroleum Geology, 5, 108-133. (cementation of bioclast-rich storm sediments on submerged marine shoal. Compared with Mauritanian shelf). Bryant, I. A. and Kantorowicz, J. D. (listed as in prep.). Upper Lias Sands of the Marchwood No. 1 Borehole, southern England, In: The Reservoir Geology of the North Sea, B.S.R.G. core workshop. (Eds J. Melvin and G.M. Walkden). Buckman , S.S. 1889. On the Cotteswold, Midford and Yeovil Sands, and the division between the Lias and the Oolite. Quarterly Journal of the Geological Society, London, 59, 445-458. Buckman, S.S. 1889. Certain Jurassic (Lias-Oolite) strata of south Dorset; and their correlation. Quarterly Journal of the Geological Society, London, 66, 80-89. Buckland , W. 1837. Geology and Mineralogy Considered with Reference to Natural Theology. The Bridgewater Treastise on the Power, Wisdom and Goodness of God as Manifested in the Creation. Treatise VI. London, William Pickering, Vols 1 and 2. Cash , D. 1979. Havoc-hit resort begins clear-up. Echo (either) Bournemouth Echo or Evening Echo, newspaper, No. 18702, Wednesday, February 14, 1979. One page, probably the back page. Article by Derek Cash with complete text below. The photographs are from another page of this paper. 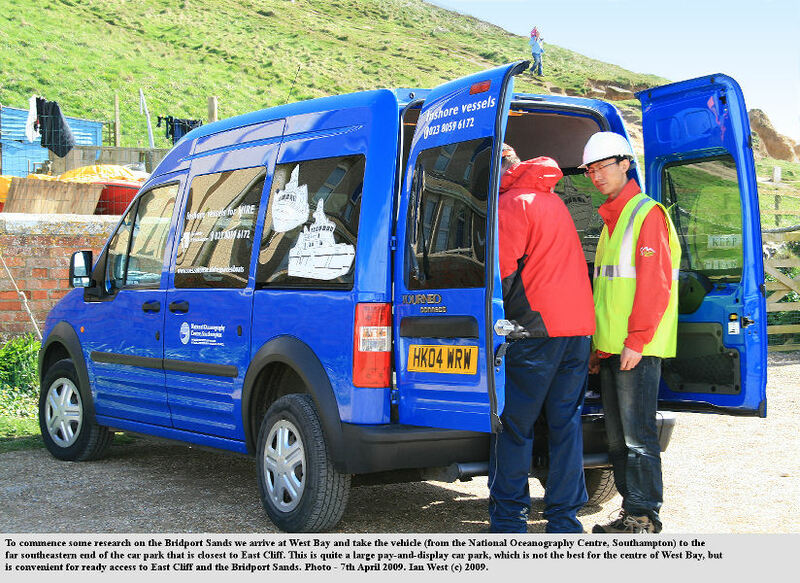 Residents and those with businesses along the sea front and behind the harbour at West Bay began a massive clear-up at the West. Dorset coastal resort yesterday. The resort was reduced to a shambles when the unexpected early morning ground swell caused extensive flooding and damage. Huge waves crashed over the promenade, ripping up coping stones and tarmac and forcing water down on to the Old Shipyard Centre below. Smashed: The western shelter on the promenade was completely wrecked and will now have to be demolished. Large stones, shingle and debris littered the roads as the water flooded properties throughout the heart of the bay. Most of the ground floor businesses at the Old Shipyard complex were flooded up to several inches in depth and at the souvenir and gift shop of Mr. and Mrs. Philip Elston the front window was smashed and thousands of pounds worth of stock lost. "We 1ater found some of it floating hundreds of yards away," said Mrs. Millie Elston, Fovtunately, there was only one place along the stone armoury in front of the Mound area of the seafront which suffered sinkage and otherwise it held firm. ; so preventing further disaster. 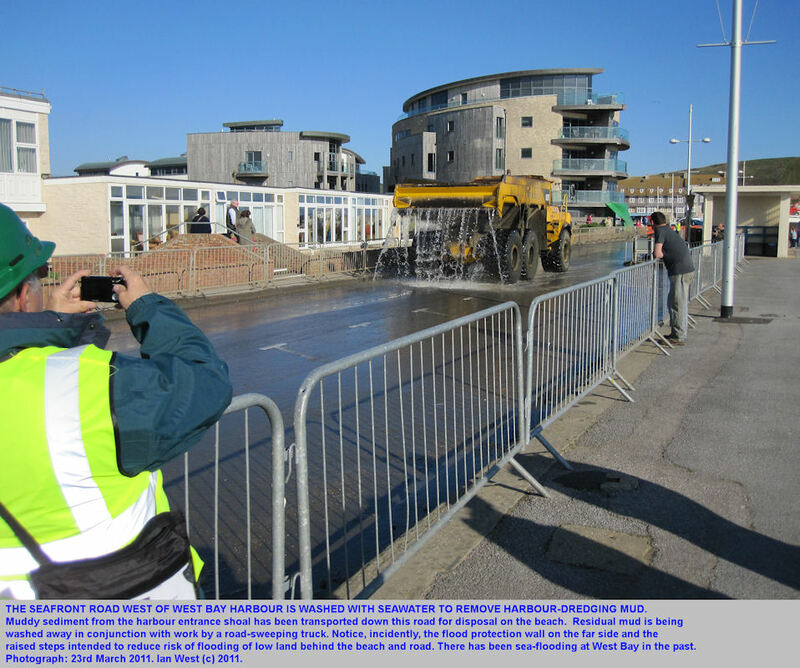 Council workmen started to clear the seafront; wall yesterday but even before last night's further tides it was not expected that the stretch would re-open traffic for at least a day or two. About two dozen people had to be evacuated from their homes yesterday morning, and Bridport firemen had tb be called in to pump water from the house of Mr. Leo Green at 2, George Street for the second time this year. Despite the mess there was plenty of good spirit present among those, affected. Mr. Harry Summers, who runs a grocers and off-licence at the Shipyard Centre with his wife, Esme, was open for business as usual despite the floodwater, while Westport Tavern landlord David Dickson said he had a busy lunchtime just hours after almost his entire ground floor was inches deep in muddy water. But one person not so happy with the situation was the wife of Harbour Garage proprietor Mr. John O'Nians. Warning: Surveying the damaged seafront, Mrs. Sue O'Nians said that their situation at the garage which faces George Street, might not have been so bad had they received a warning from the police about the flooding. But a spokeman for Bridport Police said that their first priority had always to be the safety of the public rather than property. In this case they had spent the little time available alerting people whose homes were liable to flooding. Another problem caused by the high seas is a bank of shingle whioh has been forced over from the East Beach - where it has built up over a period of time to oover completely the eastern pier and start to silt up the harbour entrance. [end of article] and start to m1lt up the harbour entrance. Cope , J.C.W., Getty, T.A., Howarth, M.K., Morton, N. and Torrens, H.S. 1980. A Correlation of Jurassic rocks in the British Isles. Part One: Introduction and Lower Jurassic. Blackwell Scientific Publications, Oxford. Cox, C.C. (undated - 1950s?). The History of the Church of St. Michael The Archangel, Lyme Regis. By C. Carew Cox, Vicar, 5th Edition, The British Publishing Company Limited, Gloucester, 16 pp. Damon , R. 1884. Geology of Weymouth, Portland and Coast of Dorsetshire, from Swanage to Bridport-on-the-Sea: with Natural History and Archaeological Notes. Weymouth. R.F. Damon. London, Edward Stanford, 55, Charing Cross, S.W. 2nd Edition. Davies , D.K. 1966. The Sedimentary Petrology of the Upper Lias Sands and Associated Deposits in Southern England. Unpublished Ph.D. Thesis, University of Wales. Davies, D.K. 1967. Origin of friable sandstone-calcareous sandstone rhythms in the Upper Lias of England. Journal of Sedimentary Petrology, 37, 1179-1188. Davies, D.K. 1969. Shelf sedimentation: an example from the Jurassic of Britain. Journal of Sedimentary Petrology, 39, 1344-1370, December, 1969. By David K. Davies, of the Department of Geology, Texas A & M University, College Station, Texas. Abstract: The refined biostratigraphic framework that has been developed for Jurassic sediment of northwest Europe enables precise environmental distinctions to he made on a time-equivalent basis. Using such control it can be demonstrated that shelf sedimentation in the Lower Jurassic (Toarcian) of southern England was dominated by the gradual migration of a large sand bar. Despite the general homogeneity of its detrital sandstones and siltstones, this bar may be subdivided into four principal environments of deposition which including 1) bar (beach and upper shoreface), 2) fore-bar (middle shoreface, 3) back bar, and 4) tidal channel. These environments are distinguished on the basis of qualitative and quantitative textural and compositional criteria; succession of sedimentary structures, bioturbation, grain size, sorting, skewness, and petrography. The bar complex is 150 ft thick, and is transitional downward and southward into condensed limestones and argillaceous siltstones (40 ft average thickness). The limestones are principally intramicrites, the intraclasts being of the same composition as the host sediment (biomicrite), and often display oxidation rims. Such deposits are considered to be of shallow, marine origin. On the other hand, the argillaceous siltstones, which may contain up to 20 percent micrite, represent deeper marine conditions of deposition. The bar complex is succeeded upward and to the north by condensed limestones of variable composition, principally oomicrite; pisomicrites, and biomicrites. These limestones (12 ft average thickness) represent a platform interior sand blanket which was developed under shallow marine conditions in the lee of the large bar complex. Because 1) new sediment was constantly added to the southward side of the bar, and 2) subsidence did not quite keep pace with sediment supply, the bar was forced to accrete continually in a southward direction, at a rate of 1 mile per 80,000 years. The gradual southward migration of the bar resulted in preservation of vertical sequences which, when completely developed, comprise a basal argillaceous and calcareous facies (the Upper Lias Clay Formation), succeeded by an arenaceous facies (the Upper Lias Sand Formation), and capped by a calcareous facies (the Cephalopod Bed Formation). Sediments comprising these three facies were deposited in two distinct basins of deposition, separated by an east-west trending structural high (the Mendip Axis). Both basins subsided to receive a maximum thickness of some 340 ft of marine sediments. Because of the southward migration of the bar, the southern basin received its major sediment input only after the northern basin had already been filled. The nature and rate of sediment supply remained constant throughout the 6 million years duration of the Toarcian, the principal source being a meta-igneous complex located in the present western approaches to the English Channel. De La Beche , H.T. 1822. 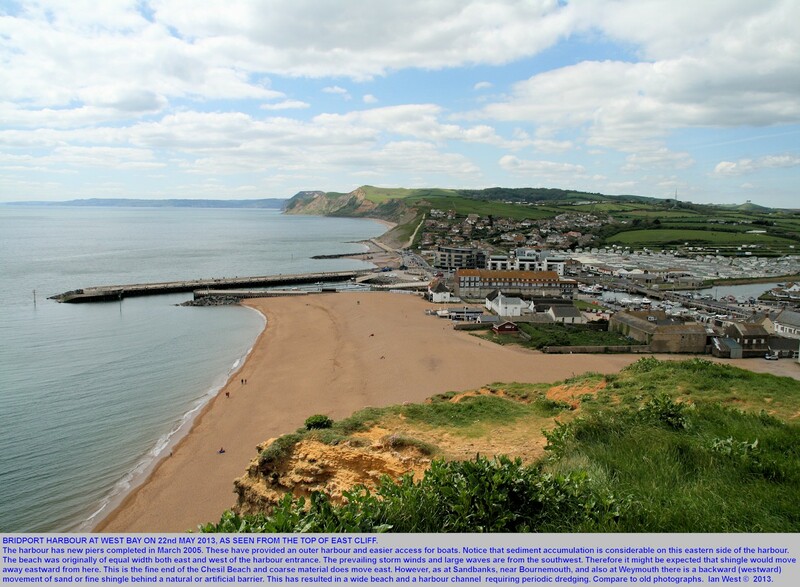 Remarks on the geology of south coast of England from Bridport Harbour, Dorset, to Babbacombe Bay, Devon. Transactions of the Geological Society, London, Series 2, vol 1, 40-47, Plates iii-viii. Dranfield , P. Langley, G.O., McLean, F. and Scottong, G. 1986. Wytch Farm oilfield development; geological, geophysical and reservoir engineering considerations. BP Petroleum Development Ltd..
Abstract: Chesil Beach has a typical transverse profile of two main shingle ridges, a 'storm ridge' and a 'foreshore ridge'. These two ridges change in shape with the formation of a step profile in constructive wave conditions, and the steepening of slopes in destructive wave conditions. During storms the beach is never actually 'breached', rather overtopping and seepage via cans occurs. In exceptional storms the foreshore ridge may be removed and the height of the storm ridge may be lowered in places, allowing further overtopping to occur. Evidence suggests that the beach is in a state of dynamic equilibrium about an equilibrium profile. 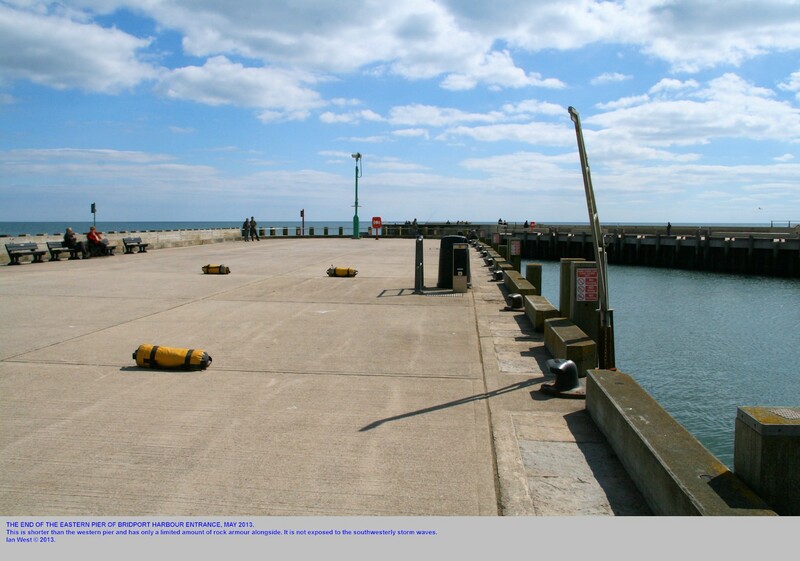 Introduction: This paper describes research carried out on Chesil Beach at Chesilton, Dorset, between 1976 and 1978. The aims were to investigate short-term changes in the morphology of the beach using transverse profiles at a single locality, and to ascertain the effects of storms upon the beach. From data collected it was intended to determine whether Chesil Beach is in a state of dynamic equilibrium. Observations of the effects of storms Between April, 1976 and February, 1979, four storms had a dramatic effect on the beach and the land backing on to it. Observations were recorded and photographs taken of the results of these storms. Hesselbo , S. 1992. Excursion A1. Tectonics and Sedimentation in the Lower/Middle Jurassic of the Wessex Basin. Pp 20-30. BSRG 1992, Southampton, Field Excursion Guides. Department of Oceanography, University of Southampton, 65 p. (Bridport Sands show changes between Thorncombe Beacon and East Cliff - see Fig 4.). Hounslow , M.W. 1987. Magnetic fabric characteristics of wave-produced grain orientation in the Bridport-Yeovil Sands (Lower Jurassic) of southern England. Sedimentology, 34, 117-128. House , M.R. 1993. Geology of the Dorset Coast. Second Edition. Geologists' Association Guide No. 22. The Geologists' Association, Burlington House, Piccadilly, London, 164 pages & plates. Paperback and not expensive. ISBN 07073 0485 7. This contains much detailed information on localities, excellent reference list and is inexpensive. This and the guide by Allison are parts of a series of field guides published by the Geologists' Association, Burlington House, Piccadilly, London W1V 9AG. See HR Wallingford website . "The marked trend for accretion on the eastern side of the West Bay piers provides strong evidence of net eastward drift at this western extremity of Chesil Beach (Hydraulics Research, 1979 1985; Jolliffe, 1979). Map comparisons and field survey covering 1901-1984 showed accretion was not continuous but interspersed with brief periods of erosion such as between 1961 and 1964 (Hydraulics Research, 1985). Littoral drift between Cog den Beach (SY 504880) and West Bay (SY 462904) was further studied by means of a mathematical beach model employing a representative wave climate derived from hindcasting, based on Portland wave data covering the period from 1974 to 1984 (Hydraulics Research, 1985). This study marked the first attempt to determine a reliable long-term estimate of drift on Chesil Beach and indicated mean net eastward transport at 8,000 cubic metres per year, which was validated by the documented trend for accretion against the east pier at West Bay. The accuracy of the analysis must be questioned, because it ignored swell waves and waves under one metre. Additionally, the shingle transport equations employed were calibrated on other beaches and therefore in need of further testing. Recent qualitative observations of beach erosion immediately east of the east pier at West Bay indicated possible changes in drift regime. Analysis of beach profiles and air photographs covering the period 1977 to 1990 revealed that the previously widely recognised trends for accretion ceased about 1982, whereupon a convincing switch to erosion resulted in mean high water level retreat of 40m by March 1990 (Hydraulics Research, 1991a). To explaining this change, wave climate and littoral drift were analyzed with techniques similar to those employed for the 1985 study (Hydraulics Research, 1991a). Wave climate was hindcast using Portland wind data covering the periods 1974 to 1990. Results showed that the wave climate changed remarkably after 1982, with fewer southeast storm waves and increased prevalence of westerly waves. Littoral drift calculations from this data revealed highly variable gross transport, with net westward drift before 1982 and a switch to net eastward drift of up to 14,000 cubic metres per year thereafter (Hydraulics Research, 1991a). These studies suggest that net littoral drift is very delicately balanced on Chesil Beach, so that slight wave climate/storm frequency variations can cause major drift reversals, thus linkages with adjoining systems are a distinct possibility. Available data covers too short a time span either to assess long-term trends or predict future behaviour. Beach morphometry is not a reliable guide because it may react relatively slowly to changes in drift regime due to large beach volume, so trends may only be recognisable at each end of the beach and will not contribute much towards an overall understanding." Hydraulics Research. 1979. 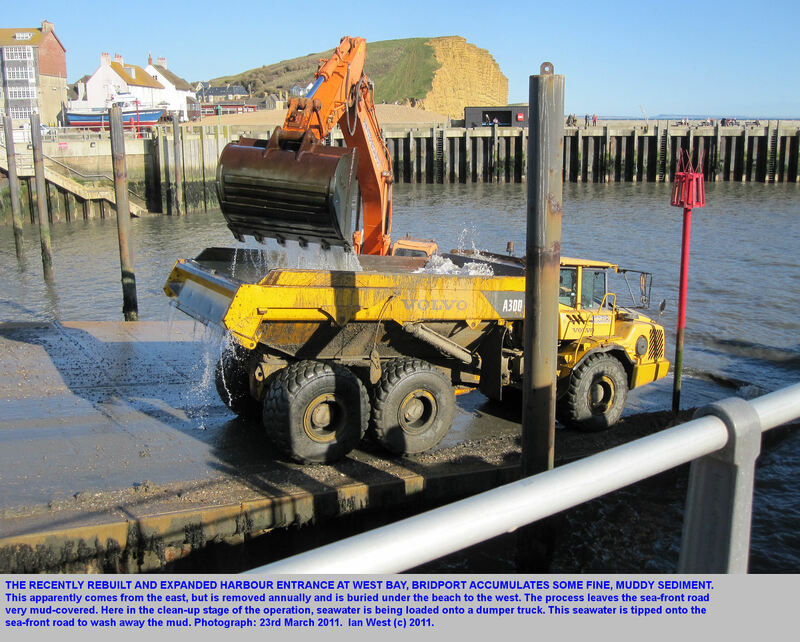 West Bay, Bridport, Dorset: a sea defence and coast protection study. Hydraulics Research Report No. EX863, 12pp. Hydraulics Research. 1985. West Bay Harbour. A numerical study of beach changes east of the harbour entrance. Hydraulics Research Report No. EX1301, 33pp. Hydraulics Research. 1991a. 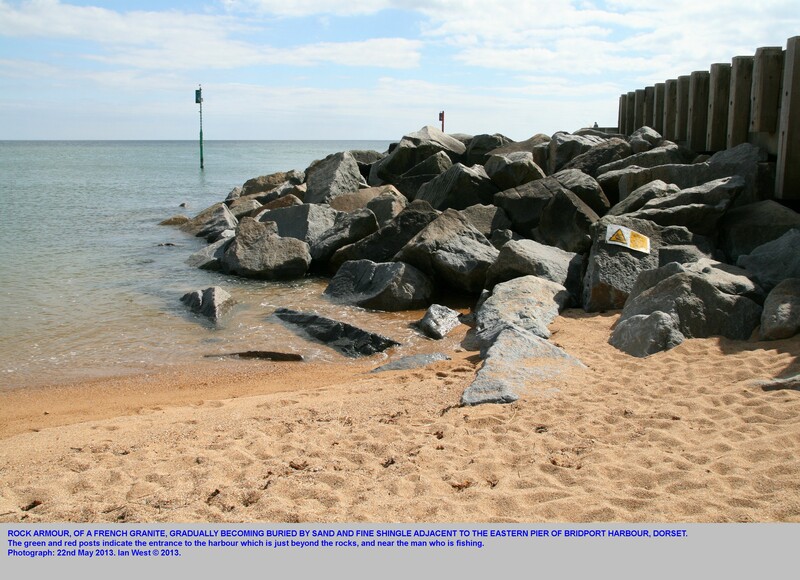 West Bay Harbour: analysis of recent beach changes east of the harbour. Hydraulics Research Report No. EX2272, 16pp. Hydraulics Research. 1991b. West Bay Bridport: a random wave physical model investigation. Hydraulics Research Report No. EX2187, 53pp. Hydraulics Research. 1999? (Modelling of the new West Bay harbour entrance and piers). Joliffe, I.P. 1979. West Bay and the Chesil Bank, Dorset. Coastal regimen conditions, resource use and the possible environmental impact of mining activities on coastal erosion and flooding. Report to West Dorset District Council, Dorset County Council, 87 pp. Joliffe, I.P. 1983. Coastal erosion and flood abatement; what are the options? Geographical Journal 149, 62-67. Kantorowicz , J.D., Bryant, I.D. and Dawans, J.M. 1987. Controls on the geometry and distribution of carbonate cements in Jurassic sandstones: Bridport Sands, southern England and Viking Group, Troll Field, Norway. pp. 103-118 in: Marshall, J.D. (ed), Diagenesis of Sedimentary Sequences. Geological Society, Special Publication, No. 36, 103-118. Knox , O'B., R.W., Morton, A.C. and Lott, G.K. 1982. Petrology of the Bridport Sands in the Winterborne Kingston borehole, Dorset. In: Rhys, G.H., Lott, G.K. and Calver, M.A. (eds.) The Winterborne Kingston Borehole, Dorset, England. Institute of Geological Sciences Reports, 81/3, 107-126. Lake , S. D. 1985. 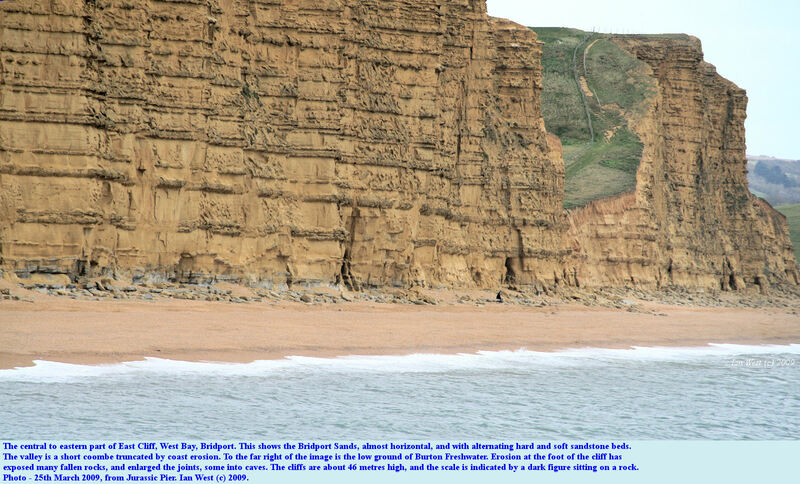 West Bay, Bridport, In: Continental Extension Tectonics (ed. P.L. Hancock), Preconference excursion guidebook, Geological Society of London. Lang , W.D. 1962. Aalenian, Bridport Sands. Proceedings of Dorset Natural History and Archaeological Society, 83, p. 34. May , V. 2005 (?). Coastal Form Processes. Part of: Physical Changes to the Coast. Webpage: Coastal Form Processes . By Professor Vincent May of Bournemouth University. Part of Dorset Coast Digital Archive - Dorset Coast Digital Archive, operated by Bournemouth University, Bournemouth Borough Council, Dorset County Council and Dorset County Museum. Example extract - Introduction:"The features of the Dorset coast between Highcliffe in the east and Lyme Regis in the west are the result of thousands of years of marine and sub-aerial processes acting upon a wide range of geological materials whilst climate, sea-level and the human use and modification of the coast have changed significantly. Coastal processes act on timescales that range from the few seconds of a wave breaking to the many millennia of sea-level change. Similarly, these processes also occur on spatial scales of a few millimetres to the scale of the English Channel and beyond. For example, a pebble falling from the cliffs at Budleigh Salterton in East Devon several thousand years ago and found today on Chesil beach has probably made a journey equivalent to the distance from Earth to the planet Neptune. During all of that time, the combined effects of waves, tides and currents have moved the pebble up, down and along the shore and buried within the beach as well." Melville , R.V. and Freshney, E.C. 1982. British Regional Geology: The Hampshire Basin and Adjoining Areas. British Geological Survey (formerly the Institute of Geological Sciences), London, Her Majesty's Stationery Office. 146 pp. Morris , K. A. and Shepperd, C.M. 1982. 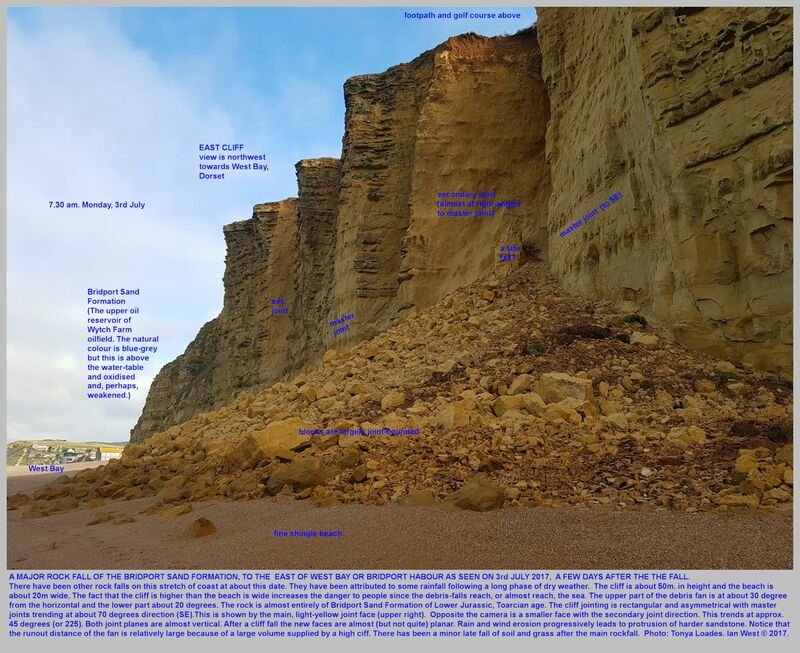 The role of clay minerals in influencing porosity and permeability characteristics in the Bridport Sands of Wytch Farm, Dorset. Clay Minerals, 17, 41-54. Natural History Museum, London . (originally as British Museum (Natural History) 1962 and various editions onward). British Mesozoic Fossils. 207 pp. Payne , D. 1953. Dorset Harbours. Christopher Johnson, London, 156 pp. By Donald Payne, with a foreword by Vernon C. Boyle. Hardback with monochrome photographs. Pickering , K.T., Taira, A. and Soh, W. 1991. Scale of tsunami-generated sedimentary structures in deep water. Journal of the Geological Society, London, 148, 211-214. Pickering, K.T. 1995. Are the enigmatic erosional sandy wave-like bedforms in Jurassic Bridport Sands, Dorset, due to standing waves? Journal of the Geological Society, London, 152, 481-485. Scopac . Standing Conference on Problems Associated with the Coastline. Website: Isle of Portland and Weymouth Bay (Portland Bill to Redcliff Point) . Scopac. 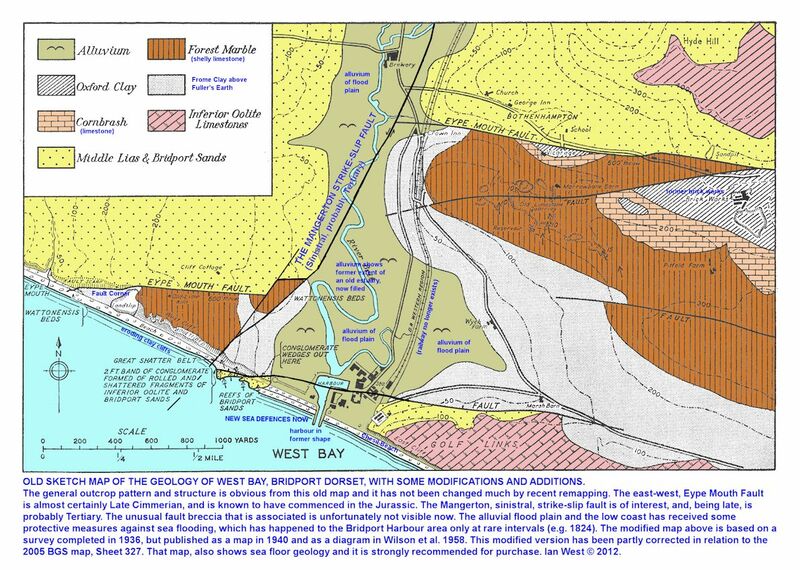 West Bay to Portland Bill - Sediment Transport (map). Symonds H. 1912. Bridport Harbour through seven centuries. Proceedings of the Dorset Natural History and Archaeological Society, 33, 161-199. Thomas , J. and Ensom, P. 1989. Bibliography and Index of Dorset Geology. 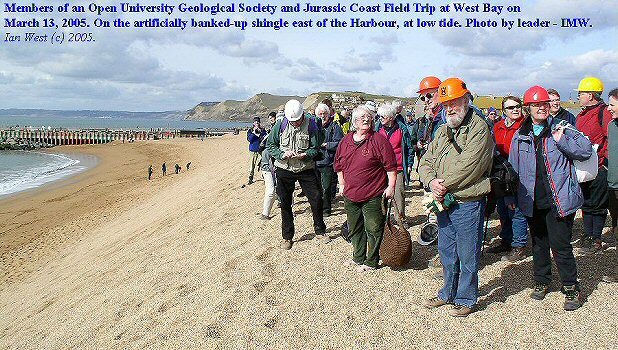 Dorset Natural History and Archaeological Society. 102 pages. (with 25 references on the Bridport Sands). 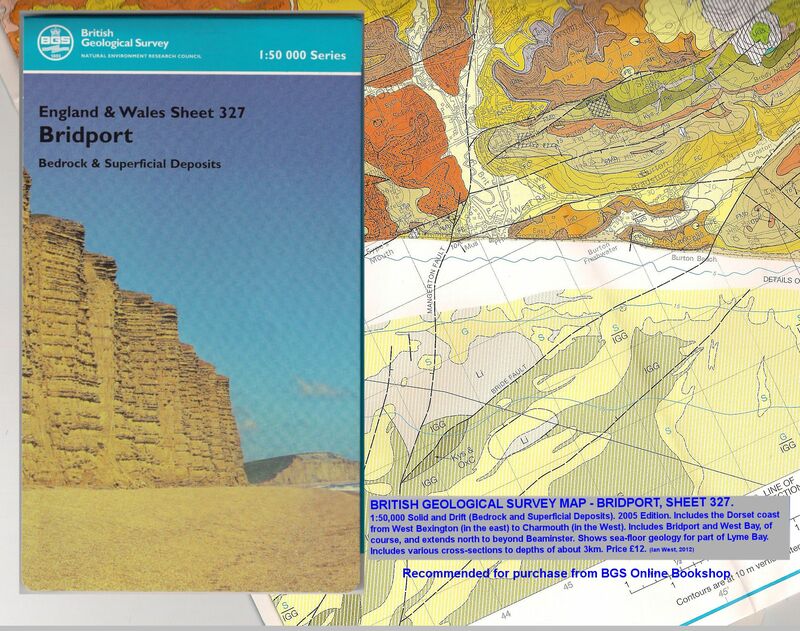 See also the internet version - Bibliography and Index of Dorset Geology. Underhill , J.R. and Stoneley, R. 1998. 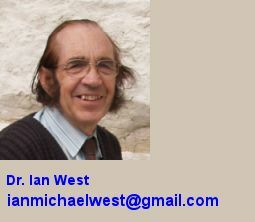 Introduction to the development, evolution and petroleum geology of the Wessex Basin. In: Underhill, J.R. (Ed.) Development, Evolution and Petroleum Geology of the Wessex Basin. Geological Society, London, Special Publications, 133, 1-18. Wilson , V., Welch, F.B.A., Robbie, J.A. and Green, G.W. 1958. Geology of the Country around Bridport and Yeovil (Explanation of Sheets 327 and 312). With contributions on: The Purbeck Beds by F.W. Anderson, Palaeontology by R.V. Melville, and Groundwater by S. Buchan. London, Her Majesty's Stationery Office, 239 pp. Department of Scientific and Industrial Research. Memoirs of the Geological Survey of Great Britain. West , I.M. 2000. Select Bibliography of Petroleum Geology of the Wessex Basin, southern England, UK - www.southampton.ac.uk/~imw/oilsot.htm. - The largest onshore oilfield of northwest Europe is at Wytch Farm, Dorset. Jurassic source rocks - Lias. Jurassic reservoir - Bridport Sands (Upper Lias). Woodward , H.B. 1887. Excursion to Bridport, Bothenhampton, Burton Bradstock, Bridport Harbour and Eype. Proceedings of the Geologists' Association, 9, 200-209. Copyright © 2017 Ian West, Catherine West, Tonya Loades and Joanna Bentley. All rights reserved. This is a purely academic website and images and text may not be copied for publication or for use on other webpages or for any commercial activity. A reasonable number of images and text may be used for non-commercial academic purposes, including field trip handouts, lectures, student projects, dissertations etc, providing source is acknowledged. Disclaimer: Geological fieldwork involves some level of risk, which can be reduced by knowledge, experience and appropriate safety precautions. Persons undertaking field work should assess the risk, as far as possible, in accordance with weather, conditions on the day and the type of persons involved. In providing field guides on the Internet no person is advised here to undertake geological field work in any way that might involve them in unreasonable risk from cliffs, ledges, rocks, sea or other causes. Not all places need be visited and the descriptions and photographs here can be used as an alternative to visiting. Individuals and leaders should take appropriate safety precautions, and in bad conditions be prepared to cancel part or all of the field trip if necessary. Permission should be sought for entry into private land and no damage should take place. Attention should be paid to weather warnings, local warnings and danger signs. No liability for death, injury, damage to, or loss of property in connection with a field trip is accepted by providing these websites of geological information. Discussion of geological and geomorphological features, coast erosion, coastal retreat, storm surges etc are given here for academic and educational purposes only. They are not intended for assessment of risk to property or to life. No liability is accepted if this website is used beyond its academic purposes in attempting to determine measures of risk to life or property.